Use Flower Servant and it will remind you when to water, mist, fertilize or repot Cordyline fruticosa compacta. Click here and try for free! 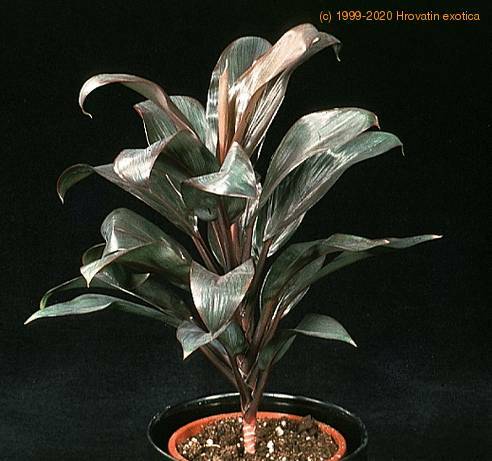 Cordylines are the most popular landscaping plant. A horticulturalist named Eugene Andre experimented with cordylines, developing many new genuses. Many new varieties of cordyline were taken to Hawaii by collectors and experiments in cross-pollinating to obtain new varieties took place. New hybrids displayed a wide range of colours including purple, crimson, scarlet, rust, pink and green, some having stripes of orange, red or white. Cordylines are a colourful, interesting plant to grow indoors, far superior in hardiness and more beautiful than others usually grown for their foliage. They can literally be started from a tiny piece of cane (called a ti log) or propagated as above and you can watch the daily growth that takes place. They are a great plant to brighten up an office environment - a living work of art, and last longer than flowers. In winter months plants should be placed by a window where they will receive some sunlight, or if no sun, strong light. When grown indoors causes of stress can be too low light, over or under watering, insufficient nutrients, infestation by mites, mealy bugs or scale, and temperature too low. Fertilise with liquid fertilisers, high nitrogen in warm seasons and increased potash in colder times. Very little fertilising needs to be done to plants grown in low light conditions (twice a year). Most Cordylines grown indoors need strong light but some will tolerate less, these include Kiwi, Carmen, Dolly, Compacta and C. glauca.